1. Put the cherries, raspberries, yogurt and honey into a liquidiser. Split the vanilla pod, scrape out the seeds and add to the mix. Blitz until smooth. 2. 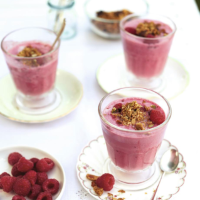 Divide the smoothie between 4 glasses and top with the granola. Garnish with extra raspberries, if you wish.